Preheat the oven to 350 degrees. Cream the butter and sugar. Add the flour and mix until just combined. Wrap in plastic and chill in the refrigerator for 1 hour. Roll the chilled dough slightly larger than the tart pan. Lightly press into the pan trim edges then place in the freezer for 30 minutes. Bake at 350 for 10 minutes. Remove from the oven and set aside to cool. Place port, vinegar and sugar into a sauce pan. Bring to a boil, then add the pears and simmer until tender. (i.e. When a knife inserts easily into the pears.) Remove from heat and chill. Preheat the oven to 350 degrees. Mix well, spread batter into the cooled tart shell. Drain the pears reserving liquid. Arrange on top of the frangipane and bake for about 30 minutes, until firm and golden brown. While warm, brush top with apricot jam and top with chopped pistachios. Reduce the reserved poaching liquid in sauce pan over medium-high heat until reduced by ¾. Chill and drizzle over tart before serving. Enjoy! Spring has sprung and it’s time to finalize your holiday plans for Easter Sunday and Mother's Day! Each spring, Michael’s On East opens its Restaurant's doors on two extra-special Sundays to provide Sarasota residents and visitors with luscious brunch buffets on these special holidays. Please join us for a holiday brunch on Easter Sunday or Mother's Day this year at Michael's On East! We recommend you secure your reservation as early as possible. These popular brunches sell-out each year (with good reason!). Please click here or call for reservations: 941-366-0007, ext. 224. As a proudly independent, family owned and operated restaurant, the entire Michael’s On East team takes special pride in offering holiday celebrations for our guests. It is also our pleasure to provide a magnificent spread for guests of Selby Gardens' holiday brunches. Please click here for details about brunch reservations at Selby Gardens. 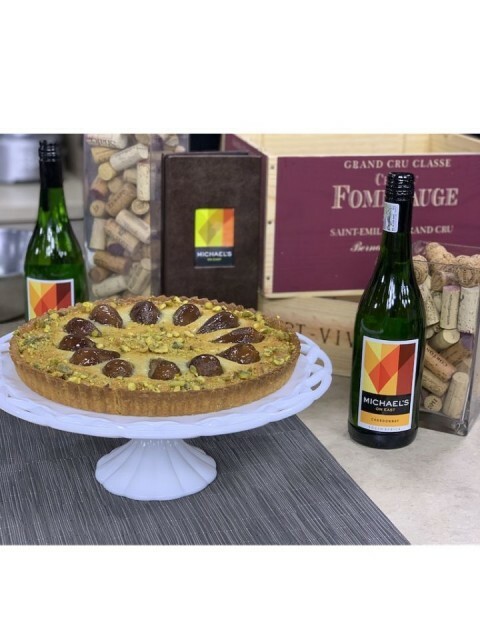 Michael’s On East Sous Chef Kory Minor shared this recipe on Sarasota's ABC 7's noon show on March 21, 2019. Here's the complete recipe in case you missed the cooking segment, or simply join us in the evening at Michael's On East to enjoy this seafood specialty available on the Restaurant’s dinner menu. As the exclusive culinary partner of Selby Gardens, our team loves designing and catering all special events at the Gardens. Over the past few years, Michael, Phil and Michael's On East Executive Chef Jamil Pineda and Wine Director Sean King have been particularly excited to coordinate details for Selby Gardens' annual Garden to Plate Wine Dinner on March 8, 2019. When choosing wines for this dinner, Michael and Sean worked diligently with Wilson Daniels to select special wines that they've personally tasted and loved from their incredible portfolio of estate and family-owned wineries. Most of the wines are organic or bio-dynamic and some very limited in availability. Craig Leslie (from Wilson Daniels) and Sean will be on hand to discuss and present the wines. For the menu, we invite you to join us as we take a culinary journey to France, infused with influences of the French Polynesian spirit inspired by Paul Gauguin: Voyage to Paradise. Please scroll down to view the complete menu. Click here for full details and online reservations. Space is limited and reservations are required. Ever since Sarasota began hosting the Orioles' spring training games, Michael's On East has honored the O's with special menus each March in the Restaurant. This year, our culinary team is venturing beyond Baltimore's borders for inspiration and a "Bases Loaded" Epicurean Adventure inspired by baseball's finest traditions. The Michael’s On East three-course Bases Loaded Epicurean Adventure dinner menu is available Monday through Saturday evenings for $38.95 per person, March 1-31, 2019. The two-course lunch offering features a choice of entrée and dessert for $19.95 per person and is available Monday through Friday, 11:30 a.m. to 2 p.m. For a “Grand Slam” culinary adventure, we encourage you to add perfectly-paired wines for $8 per glass or $15 for the pairing. Michael's On East Sous Chef Kory Minor was back at ABC 7's in-studio kitchen this Thursday, February 21, to share an "original" recipe. Michael's Bowtie Pasta - with Grilled Chicken, Pancetta, Snow Peas, Shiitake Mushrooms, Sun-Dried Tomatoes in a Light Parmesan Cream - has been a favorite on our lunch and dinner menu ever since the Restaurant opened in 1987! Heat blended oil in sauté pan over medium heat. Add pancetta, then garlic and sauté until garlic is golden brown. Add mushrooms, chicken and sundried tomatoes. Cook for 30 seconds then deglaze with white wine. Add cream, then cheese and cook until thickened. As sauce thickens, immerse pasta in boiling water for 15 seconds to heat, strain, then add to sauté pan. Add Parmesan cheese and sauté until all ingredients are thoroughly combined. Season to taste with salt and pepper then place in a pasta serving bowl. Garnish with julienne snow peas and a sprinkle of Parmesan cheese. Marinate 8 oz chicken breast in chicken marinade for 30 minutes. Season with salt and pepper. Mark on grill, roast in 350 degree oven until moist and tender, about ten minutes. Cut chicken into medium diced sections for pasta. As the exclusive culinary partner of Selby Gardens, the Michael's team is thrilled with this season's new Paul Gauguin-focused exhibition highlighting the essential role of botanicals in achieving the artist’s vision of the exotic. Together with lush displays of tropical plants in the conservatory and gardens, Gauguin: Voyage to Paradise features ten of the artist’s original dramatic woodcut prints and wood engravings, photographs showcasing Tahiti during the time of his travels, historic maps as well as visual materials that shaped his work. The special exhibition is scheduled for February 10 - June 30, 2019, and you can be sure the program has inspired new tropical dishes at the Selby House Cafe by Michael's On East! Enjoy new recipes inspired by the South Pacific for a limited time at the historic Selby House Cafe as well as our gourmet food truck also located on-premise in front of the Payne Mansion at the Gardens. Both dining experiences are open exclusively for members and visitors of Selby Gardens. While Michael's On East typically offers a traditional French Epicurean Adventure each February, this year Chef Jamil and his team decided to seek inspiration from Selby Gardens' Gauguin exhibition, creating French Polynesian-themed $19.95 two-course lunch and $38.95 three-course dinner menus available at the fine dining restaurant located just a few minutes from Selby Gardens. While Michael's On East typically offers a traditional French Epicurean Adventure each February, this year Chef Jamil and his team decided to seek inspiration from Selby Gardens' Gauguin: Voyage to Paradise exhibition, creating French Polynesian-themed $19.95 two-course lunch and $38.95 three-course dinner menus available through February at the fine dining restaurant. She's one in a million and she's all ours. Michael's On East Catering Captain Tracey McCammack recently talked with Sarasota Magazine about "How to Make a Party Stand Out." "If you’ve been to a party catered by Michael’s On East in the past 25 years, you’ve met catering captain Tracey McCammack. With a black apron, a broad smile and her hair pulled up in a saucy topknot, McCammack estimates she’s worked some 5,000 parties for Michael’s—from cozy family gatherings to black-tie galas for 500. Planning is paramount, and she resolutely recommends hiring a professional party planner for those larger-than-life events. But for the intimate home dinner parties and milestone celebrations—anniversaries, birthdays, graduations and more (her favorites, by the way, because they’re often filled with “magic moments”)—she offers us some hard-earned advice on how to make your party magic." Click here to read the complete article, which will appear in Sarasota Magazine's February 2019 issue, for Tracey's personal tips. We know our friends from Edible Sarasota truly appreciate amazing food - and drinks! - especially "edible" products with special stories. And Michael Klauber certainly has a great story to tell about Inverroche Gin. The artisan gin from South Africa recently arrived in Florida, exclusively available at Michael's On East and Michael's Wine Cellar after Michael personally worked to bring the spirit to his guests in Sarasota for three years. Click here to read the full story and learn more about Inverroche Gin. Chef Jamil is pleased to share another new recipe from the Michael's On East kitchen! Preheat the oven to 400 degrees. Combine all ingredients together in a mixing bowl. Place them on a cooking sheet pan and roast in the oven for about ten minutes or until the onion are cooked. Transfer to a blender and blend until the mixture is nice and smooth set aside for plate up. In a non-stick pan over medium-high heat, toast the fennel for about two to three minutes. (Be sure to keep stirring all the time to avoid burning the seeds.) Add the garlic, parsley and red crushed pepper and cook for 30 seconds, add the oil and cook for one additional minute. Set aside until the dish is ready to be plated. Preheat the oven to 400 degrees. Place the prawns in a sauté pan all together touching each other, season with salt, black pepper, parsley and thyme, pour the toasted fennel on top of all the prawns. Roast them for about six to eight minutes, or until you can see the head bright orange. Set aside until the dish is ready to be plated. In a sauté pan over medium-high heat, add the oil, broccoli rabe and garlic and sauté for one minute. Add the pasta and season with salt and pepper. Cook for one minute or until the pasta is hot. Set aside until the dish is ready to be plated. Preheat the oven to 350 degree. Cut pancetta into thin slices and bake in the oven until they are crispy liked bacon. In four pasta bowls, add a ladle of tomato sauce, add the pasta in a swirl in the middle, place three prawns head up around the pasta, place the pancetta on top middle of the pasta. Ladle the remaining fennel oil around the prawns and serve! Chef Jamil and team have outdone themselves yet again with another Epicurean Adventure inspired by one of the world's most delicious exotic destinations. Enjoy a two-course lunch ($18.95) or three-course dinner ($38.95) through January at Michael's On East. As you prepare for the holidays, whether your largest gathering is expected to be with family on Christmas Day or on New Year's Day as you host friends for a football bowl game, we know it can be stressful planning the menu for your in-home celebrations. Michael’s On East Executive Chef Jamil Pineda suggests this winning-recipe to please lovers of jambalaya and those with Celiac disease plus who choose to eat gluten-free for any reason. Heat oil in a large sauce pan over medium high heat. Add the chicken, Cajun spices and Andouille sausage. Cook for 5 minutes. Add one stick of butter and vegetables and cook until vegetables are transparent. Add all tomatoes, the rest of the butter and chicken stock and cook for 10 minutes stirring occasionally. Season with salt and pepper if needed/desired. Each Inverroche Gin has a distinctive profile, created using recipes blending between 20 to 30 different varieties of Fynbos, a distinctive flora kingdom found only in the southern tip of Africa, which are then complemented by additional more traditional gin botanicals.“Fynbos” is the Dutch word for “fine-leaved plants.” The brand currently has three distinct Gins (Classic, Verdant and Amber), crafted using only a handful of the more than 9,000 Fynbos botanicals. The first Inverroche Gins were released in 2011 and are now available in 15 countries. All three of the South African craft gin are now available for purchase at Michael’s Wine Cellar. Aromas: Fresh citrus, slight juniper, red bush, sweet toffee apples and delicate floral notes. Aroma: Delicate floral aromas reminiscent of elderflower and chamomile. Making its debut in the Restaurant, the Inverroche Amber Gin is featured in a new handcrafted cocktail created by Michael’s mixologists, the “Cape Town Fig Bramble.” The cocktail recipe includes Inverroche Amber Gin, Poire Williams Liqueur and bitters, garnished with Allspice-soaked figs and an orange twist. The Cape Town Fig Bramble is available during lunch, happy hour or dinner at the Michael’s On East Lounge or in the Restaurant’s dining rooms for $14. Each variety of Inverroche Gin is also available on the rocks or in other cocktails. Michael’s On East, Sarasota’s only AAA Four Diamond Award restaurant, is located at 1212 East Avenue South, Sarasota, 34239. Michael’s Wine Cellar, the adjacent retail wine and spirits shop is located at 1283 S. Tamiami Trail, Midtown Plaza, Sarasota, 34239. Michael's father and Philip's mentor, Dr. Murray (Murf) Klauber, passed away on Thanksgiving evening. "Doc," as many friends, colleagues and GCCC members will fondly remember him, was an inspiration in so many ways. A celebration of life will be held in January. For a complete searchable list of the Golden Spoon award winners organized by region, go to www.FloridaTrend.com/Golden-Spoons. They are still there — footprints up and down Longboat Key’s beach, where every morning, Dr. Murray Klauber (better known as “Murf” or “Doc”) began his day at The Colony Beach & Tennis Resort with a walk on those famous sands. While the waves may have washed the actual footprints away, the visions of the man remain — part of the history of Longboat Key — as pertinent today as they were when he arrived more than 50 years ago. Klauber died Thursday at his home on Longboat — just a few steps from his beloved Colony Beach & Tennis Resort — surrounded by his wife Sue Bassett-Klauber and four generations of family members. He was 92. Until very recently, he was as active as his age would allow, even traveling with his wife Susie, son, Michael, and daughter-in-law, Terri, on a photographic safari to Africa last year. Whenever he would appear at local events, he would almost always be dressed in his trademark shorts, a colorful, tropical shirt, with loafers and no socks — the epitome of the Longboat Key lifestyle. And while he acknowledged in a recent conversation that he was slowing down, just a bit, he still loved walking that same beach every morning, “though not as early as I used to,” he said.